As many of you will remember I spent a week in July at Le Tour with @SteamyWynndows & @AndyMWild and as a result of that trip, ended up the proud owner of a limited edition Team Sky jersey signed by the riders. 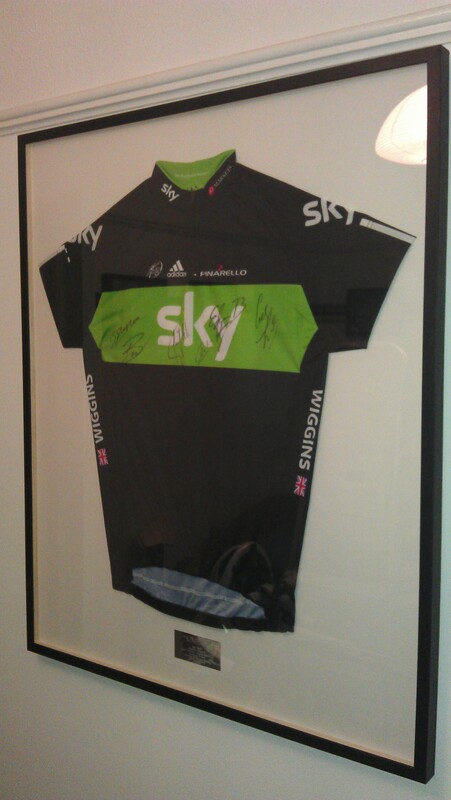 Since returning from the Tour I’ve been determined to make that Sky jersey the centre piece in my lycra-man cave… less affectionately known as ‘the 3rd bedroom’. Now finally, the room is complete. The hand painted World Champion stripes are finished, the jersey has returned from the framers, the pictures are hung and the adminration has begun! But this room isn’t just for looking at, it’s become my motivation. Where better to punish yourself in front of a Sufferfest video (or two if you feel particularly anarchic!) than in a room surrounded by memories of World Champions and pioneers of the sport!? 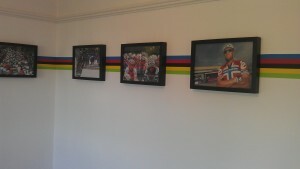 Short of riding your turbo in Jens’ garage, you can’t get much more motivational than my new bike room! I’m very pleased with it and I hope The Sufferfest see fit to add me to their list of bike torture chambers. So when a friend asked why I had decorated the room in homage to my idols… I answered, “Because I can!” Check out the video below and let me know what you think. SWEET, Stevie! I totally dig it!